A lush, green tropical landscape theme with palms as the focal point is one that is most popular with landscapers. Palm trees have always been associated with sun, white sandy beaches, retreat, and lifestyle of tranquility. There is nothing quite-like the resort style, vacation like effect created by palm trees. In Florida, anywhere you look you’ll see beautiful palm trees. You will find them being used in many landscapes such as botanical gardens, shopping malls, along streets and coasts, near swimming pools, and resorts. If you’re looking for the best Florida-grown palm trees, something out-of-the-ordinary in your landscape to make a unique statement, then look no further. 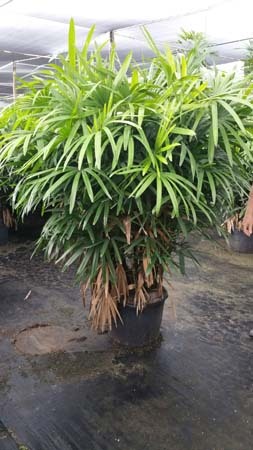 A Quality Plant is a Wholesale Palms Florida supplier specializing is growing palm trees from our nursery. We are nestled in an absolutely prime location for growing beautiful Florida grown wholesale palm trees. It takes-strong roots to be the premier grower of top-quality palms in Florida. We are well-known for our excellent landscaping services throughout Florida and are proud to-draw on the expertise and experience of generations of Florida palm growers to bring our clients the best palm trees money can buy. Over the years, we have serviced clients throughout the following areas in Florida (but not limited to them): Miami, Clearwater, Seminole, Brandon, Dunedin, Tampa, Orlando, Gulfport, Belair, Jacksonville, Pensacola, Ruskin, Gainesville and St. Petersburg. The ultimate goal of A Quality Plant is to supply landscape contractors and homeowners alike with the top-quality palms and to ensure the palm specimens are compatible with the location. This guarantees that our customers can enjoy their palm-trees for years to come. As Florida’s top distributor of wholesale palm trees, we sell several palm varieties that are ideal for the Florida area. Whether it is Canary Date Palms, Areca Palms, Sylvester Palms, Medjool Date Palms, Bismark Palms, or Sabal Palms, we have just about-every palm variety that you can imagine. With extensive nutritional programs and high-tech, fully-automated irrigation systems, A Quality Plant continues to prepare for-the future. We have illustrations of some of the different varieties of palm trees available from our nursery. If you would want to see the addition of more palm-tree pictures, or want to comment about anything, then send us your feedback and suggestions. Our prices and services are geared towards the needs of the landscaping industry. If you are a professional in the landscape industry, we-invite you to browse our catalog and view our huge selection of choice palm tree varieties that are sure to transform any landscaping project from lackluster to astounding. We appreciate your interest and look forward to forming a long term working- relationship with you. A Quality Plant looks forward to helping you with your next order. Request a quote or contact information to find out how we can be of help for you to achieve the beautiful, lush landscape that you’ve always dreamed of.